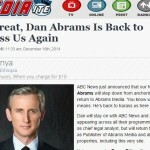 On Thursday, December 18th, ABC News announced that Dan would be stepping down from his position as co-anchor of Nightline to return to his own Abrams Media. 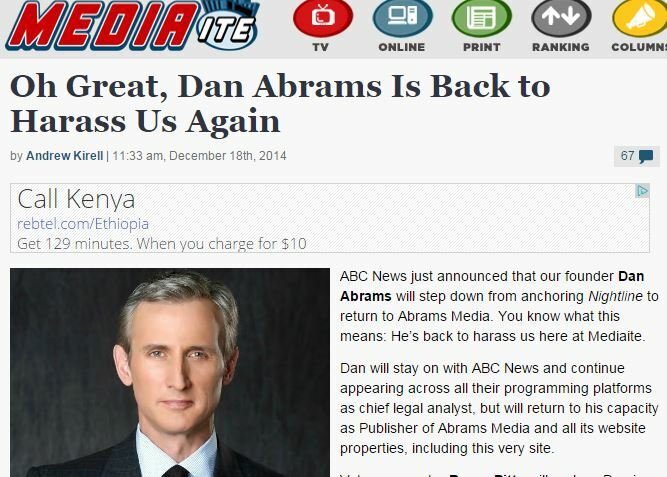 Despite this change, Dan will still be staying on with ABC News as the Chief Legal Analyst correspondent, appearing across all of ABC’s programming platforms (as per usual). Dan spoke out on Mediaite.com about leaving Nightline and what the show has meant to him. Says Dan, “The opportunity to anchor Nightline and work with that incredibly talented team will always be one of the highlights of my career. I am also so proud​ ​that ​the ​team​’s creativity and compelling story-telling​ ​​​led us ​to become the #1 show in our time slot.” … And why did he make this switch? He adds, “Abrams Media ​i​s​​ ​my ​passion…I ​have also realized how much I miss the day-to-day of running my digital media business. I am ​excited​ to lead its expansion, promotion and ​to create ​​original video and other ​new ventures…” Read the full piece here.